Do you use Facebook, Twitter, LinkedIn or any other online social media and file sharing platform? If yes, have you ever wondered, 'where are all the files, photos, videos, post and others that I share on the website saved?' well, if you have not or you have but still do not know the answer, here is the simple straightforward answer, all your media, files and even post that you share on a website are saved in another person's computer -the computer of the website you shared it on. Here is what I mean. Internet is just a wireless connection that connect two or more computer or device together just as Bluetooth, Wi-Fi, and Li-Fi etc. Server: the computer where the website being accessed is found. Client: any other computer or device accessing a particular website. In most cases you and I are the client, because our computer is not where the actual website is found, but we use our device to access the website. 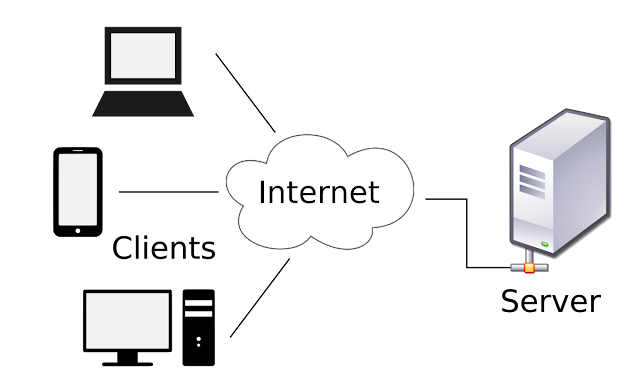 When you access a website, anything you do, save or share on that website is stored in the website server, that is the computer where the actual website is hosted on. You may think, that means that the server will be a very big computer to be able to store all the files you and others are sharing. Well, if you do, you thought wrong, the server in most cases is just an ordinary computer like the one you are using, but it was optimized so as to be able to serve as a server for a website also to have a storage device big enough to store all the data you and others share. Thus it is the storage device, that is the hard disk of the server that is very big not the actual computer, and thus in most cases the hard disk of a server is not the built-in storage device but an external one. So you see, the data you share online is not just in the air, it is in another person's computer, that is why the files you share in one website will not be available in another website unless you share it or link it to the other website. Invalid Server Certificate _What Does It Mean.